Never been to Morocco? Why not include it in your bucket list? After all, it requires no visa for Filipinos. Just bring your passport with you, buy a ticket with connecting flight to Morocco, there you go. Ask me, I have been there recently. 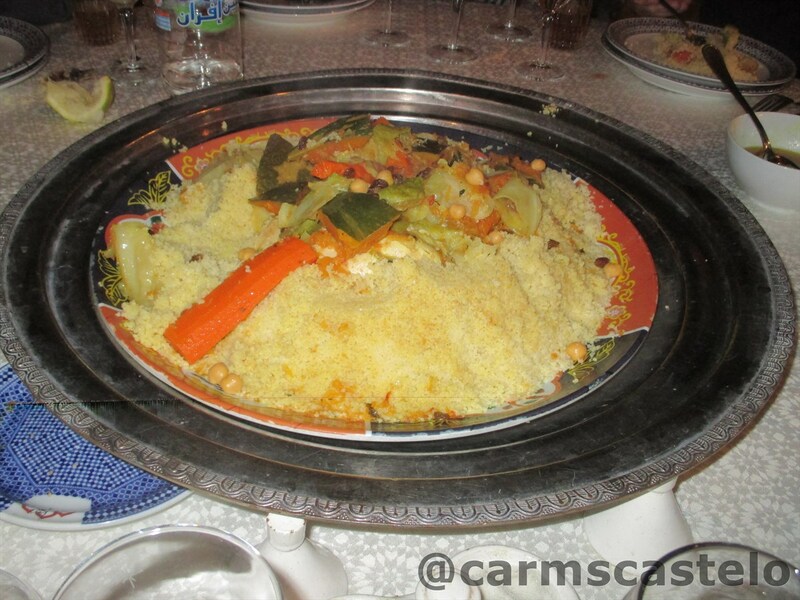 As to food, lamb is part of the Moroccan tradition. So, for me who is used to lechon (roasted pig), roasted lamb is a different take. 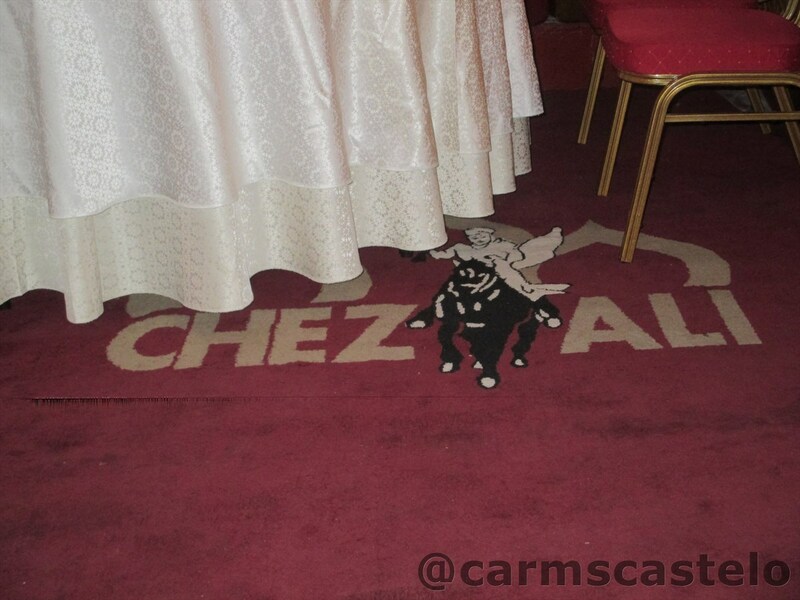 Thanks to the hospitality of the Moroccan people who treated us to Chez Ali with sumptuous Moroccan meal and wonderful show amid freezing evening. At the beginning of the meal we were treated with Moroccan harira, a classic Moroccan soup with strong flavor of turmeric, cinnamon and cumin. It comes with some sort of pastries. Next is the Moroccan lamb. To me, you have not yet been to Morocco (and Moroccan cuisine) without trying their lamb. 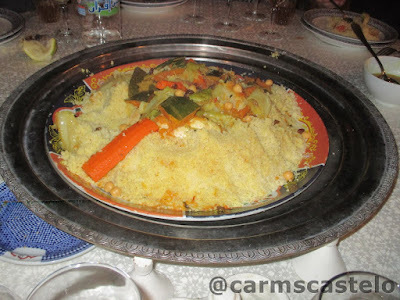 I like the couscous with seven vegetables. To me, it is their version of chopsuey cooked in a different way but with fine rice. If one is not used to eating lamb or the harira soup, one can take the secondary dish. I was so full already after over a bowlful of soup and then some sort of panic eating with lamb. I did not expect there will be more to come. I thought I can eat more veggies at home and not often eat that pretty expensive lamb. 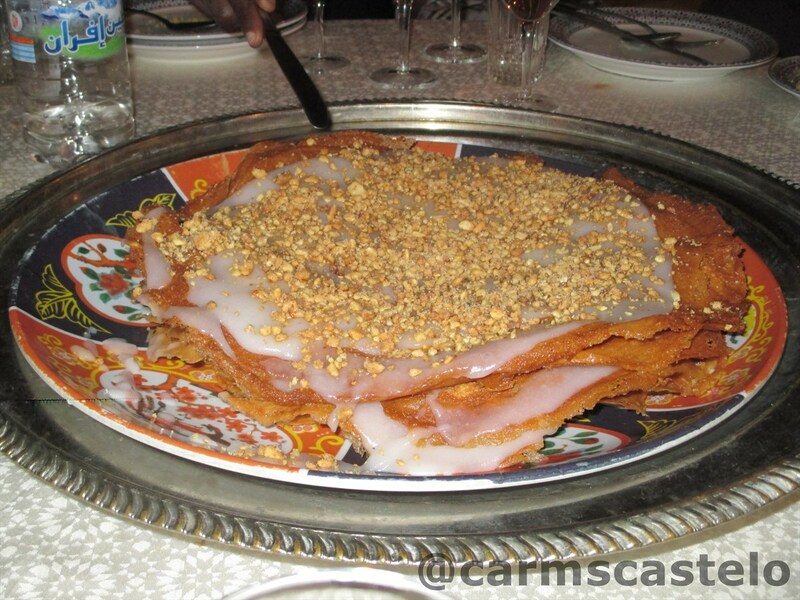 Jawhara, a dessert topped with nuts, that comes in a huge serving plate for us to share in a round table. I thought of "oh, thank you, but I am so full" but the rest among our group in one table had to encourage one another to eat more and try it as it tastes really good. Indeed! You might think that the dinner ends with jawhara but it did not. Another big and whole servings of fresh fruits come to us. 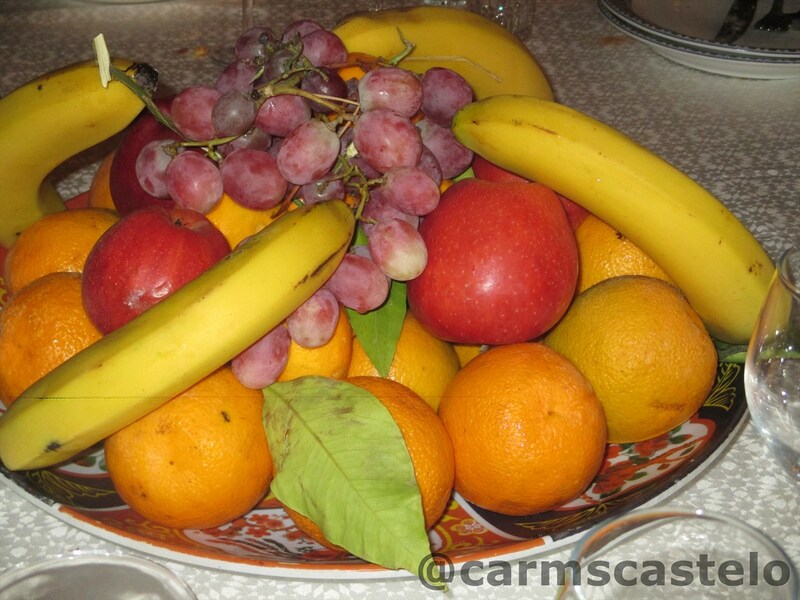 In the Philippines, I can be contented with one banana but for the Moroccan way, it is a plate full of whole fruits including the stalk of the orange, an indication that it is fresh. Lastly, a Moroccan meal will not be complete without the Moroccan mint flavored tea served from a silver ware with a pointed tip to make pouring more exciting. I have been to Morocco for a very short period of time of three days. 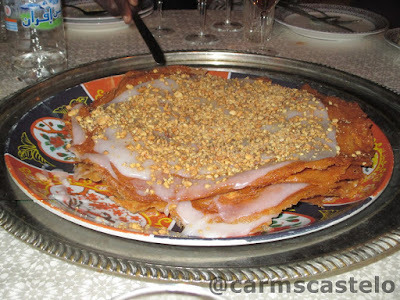 I am sure I have not yet tried all of Moroccan cuisine that I have to explore. Aside from Chez Ali where I have been, the food that the restaurant at the hotel where I stayed is indeed great. I ate a lot every morning thinking that I will save for my next meal. I still eat a lot in noon time just to double sure that I will save my dinner. It worked and I do not even have an idea if I will ever be back to the beautiful country of Morocco, once more in my lifetime. Thank you, Morocco. Thank you, Africa.